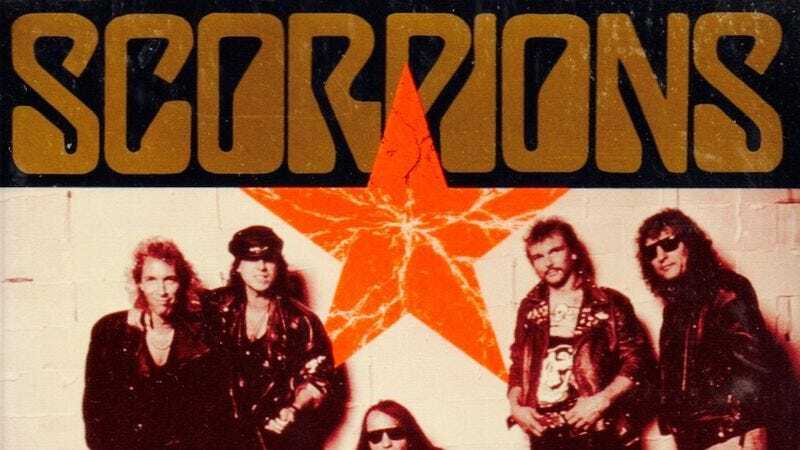 Even though they’ve been collectively melting faces since 1965, it took until the mid-1980s and early ’90s for German rockers Scorpions to hit its commercial peak. But for all the success of bona fide hits like “Rock You Like A Hurricane” and “Still Loving You” the band reached the highest high of its career with the 1991 single “Wind Of Change” (a song The A.V. Club has also previously examined). The power ballad perfectly captured the hopeful mood and feeling within a Germany—and most of the world—coming to grips with a post-Soviet Union future. For some reason, Rolling Stone recently sat down with most of the members of the group for an extensive oral history of the quarter-century-old smash. Amid tidbits about the songwriting process and the band’s battle with the record company to keep the track’s signature whistling refrain, there’s a number of interesting revelations about what the song’s actual meaning. Rather than dealing with the fallout of the Berlin Wall coming down or about the unification of the band’s home country, as many presume, “Wind Of Change” was actually inspired by a music festival in Moscow that Scorpions participated in back in 1989. The whole thing, with contributions from Meine as well as from guitarist Rudolf Schenker, the band’s former manager Doc McGhee, and the song’s producer Keith Olson, is certainly worth a read, if only to recall a simpler time when it was believed that tight, black-leather-wearing German metal bands could change the world. You can read the full piece at Rolling Stone.